I woke up in the night with that harbinger of doom – a horribly scratchy throat. I thought I would just get up, get a drink and sit in the living room and knit until A got up. But then I looked at the clock – 11:30. So I spent the night trying to sleep without swallowing. This does change the Friday list a bit – no game night tonight. No rushing about – I’ll get done what I get done. That being said, I have already refilled all the bird feeders, including hummingbird. The chipmunk was noshing immediately, so I did a really mean thing. I let Tigger out. She caught him immediately. He survived, but she let him and his brother know they are not welcome. I left her out for about an hour, until she started stalking birds, then I brought her in. She is eager to go out again, but I won’t be letting her out regularly, we really do want the cats to be indoor cats. Doesn’t she look sweet and innocent here? No, she is a fierce hunting cat. 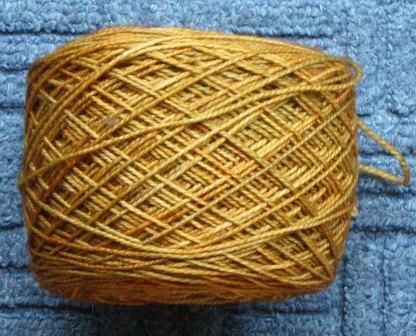 Next pair is with this Tosh Sock in ginger colorway. I am doing the business casual pattern again – this time, one at a time – I hope it goes more easily! 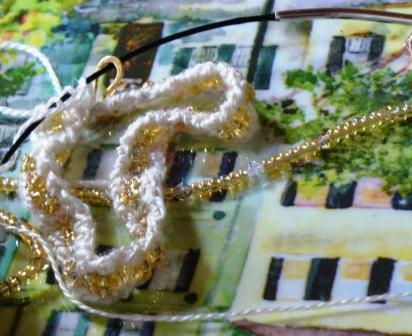 But I really do like the pattern, and I think it will look well with this nice golden yarn. I have already cast them on, check THAT off the list! 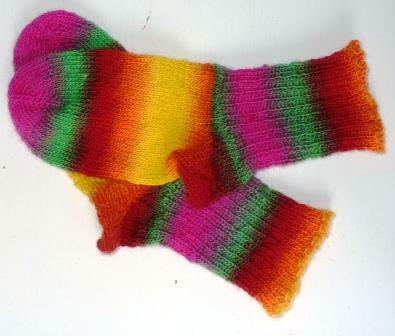 I also made a big decision – what to do with all the left over sock yarn! 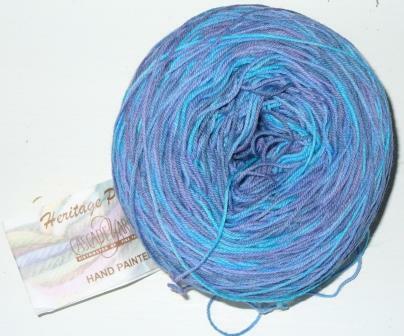 I am going to crochet up granny squares on a fairly small hook, and at the end of the year, when the sock making slows down, I will make an afghan. So in between socks, I will be working on the little squares. Now I am off to sort the laundry and make the grocery list… then a nap. This week, writing the list on Thursday night for publication Friday is a bad idea. This has been a really long week (for a short one) and I am exhausted. dig in yard to set up pool. It is clear to me now that I will be working on this for many weeks. I thought of hiring some strong teenagers to help me, but I don’t know any. And I am basically cheap. read some more of my book club book. I still have a few weeks, but it is going slowly, even though I really like it. Appropriate, as it is entitled “Slow Travel” great story of two ladies of a certain age who sell their house, invest the money and travel each winter off the proceeds. Author is a friend of a woman in book group, and will actually be attending our next meeting! 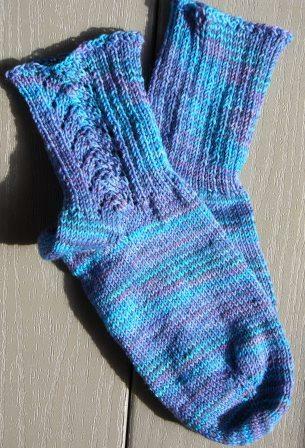 photos of the socks I finished tonight, and post them. 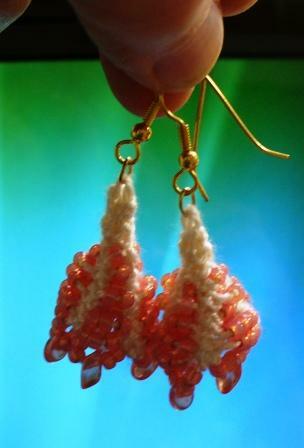 cast on a new pair – #13! do some research about how to keep suet and squirrels separate – check out tip slipped stitches gave me…. make, write, and send card to coworker who has been out for months with serious health issues. maybe take a nap so I am awake and lucid for game night? go to game night and win! Jeesh I had better not add anything much to this list tomorrow, I don’t see how I will get all this done. Because my dear old blind cat Frankie was an indoor/outdoor cat in her prime, and an excellent, excellent hunter, I never fed the birds. It seemed cruel. Now that Old Frankie is gone, and we have the new three, they are all indoor cats. So we have begun feeding the birds. It started a few years ago with humming-bird feeders. Then a suet feeder. Then, for Christmas, I got a “squirrel proof song bird feeder” by Audubon. I was sceptical, but I filled it up and sure enough, small song birds came to feed. But not many. My sister-in-law suggested filling it with black sunflower seeds. I did that, and mixed in a little thistle, because I had seen some goldfinches in the neighborhood. Well, now we have lots and lots of birds around – chickadees and nut hatches and hummingbirds, mourning doves, three different sizes of woodpeckers (hairy, downy, and pileated) and some little birds that I think are tree swallows. We also have a gray squirrel who is determined to get into the suet, but I think I might have slowed him down on that score some by putting the post in a plant pot in the middle of the deck. I am sure he will figure it out, but it will take him a bit. And there are squirrel teeth marks in the top of the feeder, but so far, the lid clamps have held, and he can’t fit into the grid. But the little chipmunk can. Yep. I looked out today and he was noshing away on those sunflower seeds. I rapped on the window and he left, briefly. The next time, I picked up a protesting Zumba and we went out. She was wild to get down, and vocal. I didn’t put her down, but Mr. Chipmunk got the message – he should hide for a few minutes. Next time, I went out with a squirt bottle. He looked right at me and dared me. So I squirted him. Not just until he left the feeder, but when he scurried on the ground. Nailed him a few times too. Then I sat quietly, and when he returned, I did it again. Three times before the black flies found me. Meanwhile, A sat on the couch laughing at me. But she won’t be laughing if it works. Also, something got a mourning dove. I think a hawk or something because all that was left was feathers, sometime last evening or this morning. So maybe it is cruel to feed the birds even when I don’t have a mighty hunter of a cat on the prowl? In spite of my work, the cats still love their live “theater” – they sit and watch all the activity for hours. I am amazed again – Craftmanic Mommy nominated me for a Liebster award. I have gotten them before, but still I feel a thrill when I read someone’s award post and see my blog there. It’s a huge compliment! 1. What is something you would like to do other than what you do in your spare time? I would like to learn to paint pictures. Ones that people can tell what it is I am painting. And ones that don’t look like a child painted them. 6. Facebook? Myspace? LinkedIn? I am not strong on any of these, but I guess I do more on FB than LinkedIn and have never been on MySpace. 7. What’s one thing in the world would you want to improve? I would just love to be able to create real and lasting peace. Barring that, let’s eliminate poverty. 8. Apple or Android? I must confess to having neither. I have a plain old cell phone for work, and none of my own. 9. Favorite quote:”Most people are about as happy as they make up their minds to be.” Abraham Lincoln. 1 why do you blog? 2 what is your favorite day-off activity? 3 what do you know now that you wish you knew then? 4 What do you do really well? 5 What’s your favorite food? 6 Would you rather cook or do dishes? 7 What are you reading these days? 8 If I were to give you a $500 gift card to a store, which store should it be? 9 Are you introverted or extraverted? 10 What are your favorite shoes (and why)? Have at it – I am curious to learn more about you! Author salpal1Posted on May 24, 2014 Categories what I am thinking about6 Comments on Another Liebster award! I’ve been just puttering away at things – and at this rate, the pool won’t be ready until August! I found I really do have to move at least one rock pile. I have moved a few barrows full already. Several more to go, and that is just so I can dig up more. This is what I get for being lazy when I prepped the ground for the smaller pool – I just piled the rocks out of the way, with no thought to maybe using the space for anything later. Sigh…. Planted the lilac that I ordered to go outside the screened porch… but it’s not planted outside the screened porch, because they aren’t done with the siding yet. I planted it around back near our bedroom deck, so we will still be able to smell it. I guess I’ll order another one for that space next year. We also have stowed a ton of pellets for next winter, and have another ton out in the dooryard. We load half a ton a day, so it isn’t a huge deal. Then we need two more tons before the end of the summer. Glad we have a big, dry cellar fr storing them all! Got the groceries while we were in Bangor – love going to the big supermarket! 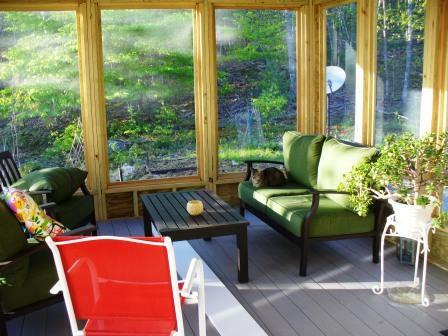 And I reserved a big Toyota Highlander for my trip to CT next month to niece C’s graduation – Mom and I are going down, and we will head to IKEA before we come home – hoping to get our dining room chairs, and they should fit into the big car. We BOTH have 4 days off this weekend! Such a rarity. 🙂 It means, however, that my Friday list is not my own. This Friday is the opening day for one of my favorite local farmers’ markets – Stonington. It is supposed to be rainy and dull, and local is a euphemism for “in my County, but an hour away” and A doesn’t really enjoy farmers’ markets, so I will hold off on going to that for another week or two. I can begin prepping for the pool in the rain (although, I would rather do it on a cool cloudy day than a rainy one). Last week we bought a new pool for me, a replacement for the one that met its demise last fall. This one is deeper – 4 feet! and wider – 20 feet! so I need to expand my circle of rock-less sand in the yard. I hope it won’t be too terrible a job. Like the expanded circle will be over the only bit that has no giant boulders under it. I can dream…. I would love to have the new pool set up and commence filling it before the weekend is over. It is killing me that I am missing all this rain for help filling it. This might be the whole list, as we have 4 days in which to get the usual chores done, and A will be there to help with them. But I might also find time to get up into the craft room/disaster area to get ready for when dear friend Crimson Crow comes over to play “Clean Sweep” with me, and help me sort out, clean up, and TOSS until it is neat and organized up there. If I am brave enough, I will post before and after photos. But it might be weeks before there is an “after”. And photos of “before” might be too scary for me. Yeah! It feels good to be home. Cats aren’t admitting they noticed I was gone or care. They are cats. A was happy to see me. Yesterday was one of our anniversaries, the 5th anniversary of our commitment ceremony. Amazing! Monday is our first wedding anniversary – even MORE amazing. And we have been together 12 years. How time flies. While I was gone, the cherry trees filled out with some leaves and blossoms, and a bunch of tulips started blooming. I’ll get some photos of the little bulb patch, it is very colorful! One daffodil, 9 red tulips, and a bunch of purple muscari. The mountain laurel and lilac I ordered last winter arrived, I will have to figure out where to put them until the siding gets put on the porch. When I ordered them, I thought construction would be done by now hahahahahahahaha. I’ll probably pot the laurel and wait, but find a different home for the lilac and get another next year. The cushion I ordered for the porch swing also arrived, so I will now be able to make the swing. I am making it out of pallets, and wanted to have it and the cushion match. Seemed easier than finding a cushion to fit, later. Maybe I will get to work on that in the next few weeks.